Who: Individuals age 13-18 (as of January 1 of the year of application) and have at least 1 year prior 4-H experience. Timeframe: Apply by May 15, selection, training, service to OSF, and evaluation. Complete responsibilities by August 31, 2019. What about the Teen Leadership Council? YES, these members may apply for 4HEYA AND TLC this year, if desired. TLC applications will be available in June and will be due the Friday following the Ohio State fair. Their term is September 1, 2019-August 31, 2020. Current TLC members are not eligible to apply for 4HEYA, as they are already fulfilling obligations at the Ohio State Fair. On behalf of Ohio Military Kids (OMK), we hope you have enjoyed your holiday season and will have a Happy New Year! Now that 2019 is here, the Ohio Military Kids Program has some major updates. On our website, we have posted our 2018 Year in Review video. This video highlights some of our biggest memories and experiences from the last year. Our 2019 scheduled events are also updated on our website! Do you have camp counselors who are looking for another opportunity to serve? The OMK Program is looking for qualified candidates for Camp Kelleys Island in August of 2019. Applications are linked here to our website and are due by February 15, 2019. We also have several opportunities for people to volunteer and support our program. There are events starting in April and goes throughout the entire summer and most of the fall. Please visit our website to see these opportunities. Please check out our website at: go.osu.edu/OMK to see all of the updates and share with military families. If you have any questions, please feel free to contact Kayla Oberstadt, OMK Program Manager, at oberstadt.1@osu.edu. 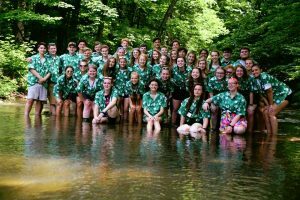 REMINDER: 2019 Camp Counselor Applications Due! 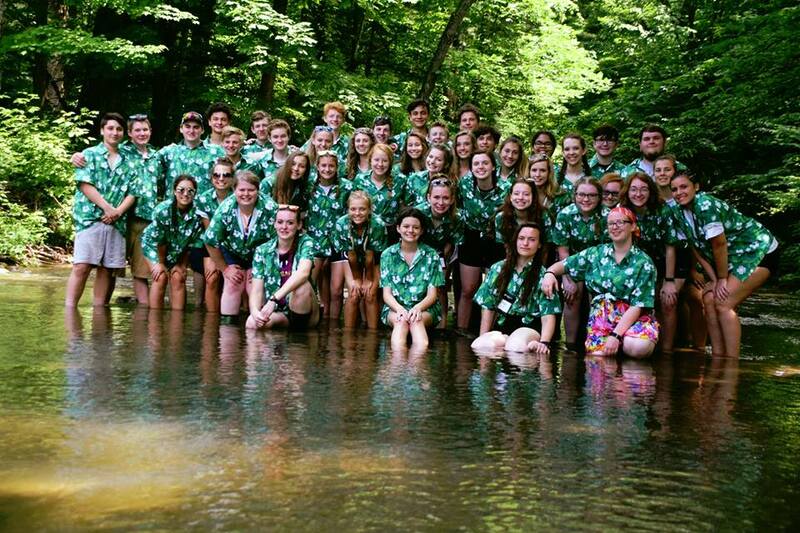 4-H Camp Counselor applications are due to the Extension Office by 4:30pm on Friday, December 14, 2018. Applications can be dropped off or mailed into the office (771 E. Main Street, Suite 103, Newark, OH 43055) or faxed in (740.670.5317). New applicants should also schedule an interview time by calling our office (740.670.5315). Interviews will be held on Tuesday, January 8, 2019 at the Extension Office. LAST CHANCE! 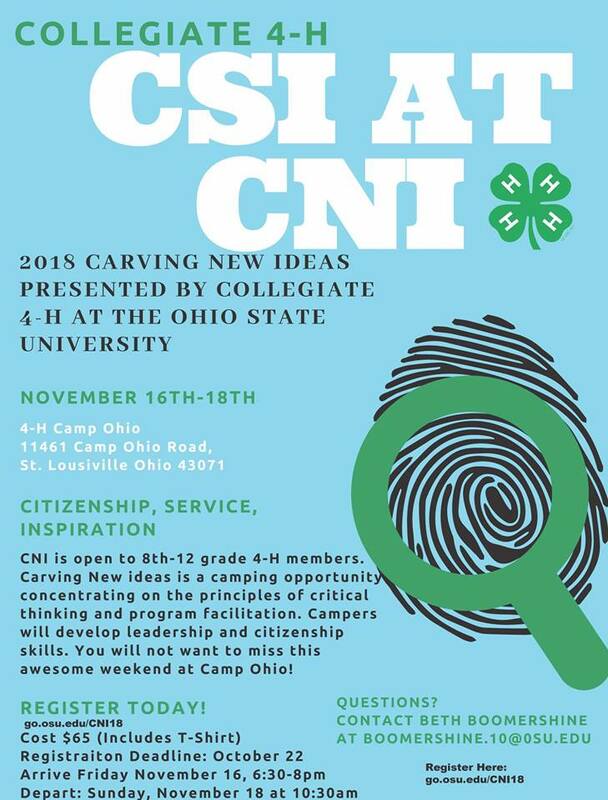 Register for Carving New Ideas! Don’t Miss Out! Carving New Ideas registration deadline is October 22nd! Open to 4-H members in grades 8-12! Information and registration materials can be found here. REMINDER: Achievement Forms are Due! Achievement forms are due to the Licking County OSU Extension Office by Friday, October 19, 2018 at 4:30pm. All of the forms you will need can be found on the Member Resources page on the website. You will need to have your forms signed by you 4-H advisor, so please allow time to connect with your advisor before they are due. If you have questions, please call our office at 740.670.5315. The Licking County 4-H CARTEENS program is a traffic safety program for first-time juvenile traffic offenders. In partnership with the Licking County Probate Court-Juvenile Division and local law enforcement, a monthly two-hour traffic safety education program is facilitated by 4-H teen members. The CARTEENS introduce guest speakers, lead group-learning activities focused on traffic safety and provide overall coordination of the session. A Juvenile Court representative and officer from the Heath Police Department provide materials resources and serve as guest speakers. Buckeye Leadership Workshop is a learning, sharing “workshop” intended as a balanced program of social, physical, mental, and spiritual activities. We believe that Buckeye Leadership Workshop provides a powerful learning environment in which anyone who works with people, professionally or informally, can develop programming for youth or adults. The workshop also benefits those who simply enjoy associating with great people, experiencing new ideas, and learning new skills. Experiential learning through recreation is truly the intent and methodology of Buckeye Leadership Workshop. The deadline to register for BLW is March 1, 2019. More information and registration materials can be found here.